Shifting Into Reverse, Detroit Automakers Lose Some Market Share : The Two-Way Chrysler, Ford and General Motors gained share in 2010 and 2011. But Toyota's rebound and other factors have led market share gains for other automakers. 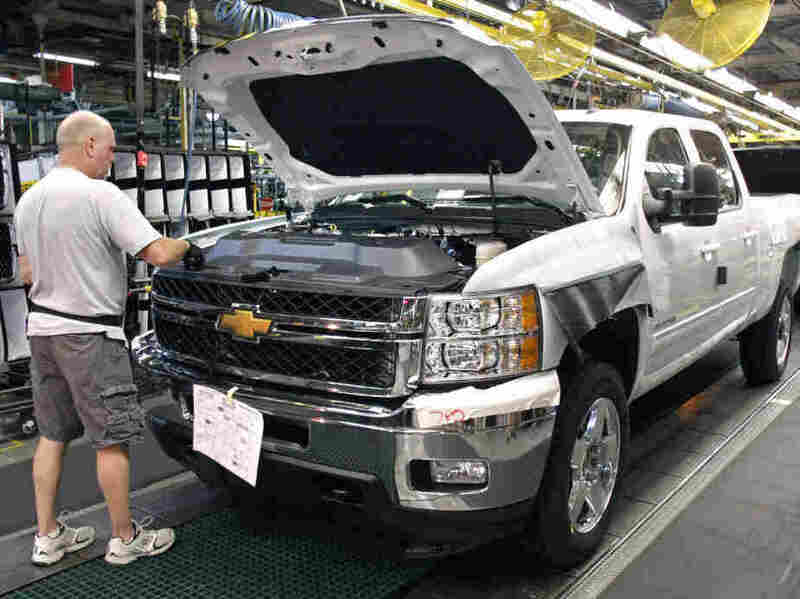 A worker assembles a Silverado truck on the assembly line at the GM Flint Assembly plant in Michigan. Chrysler, Ford and General Motors gained market share in the past couple years. Helped by Toyota's much-publicized recalls, the problems that Japanese carmakers faced after last year's earthquake and tsunami, and an improving reputation for the quality of American-made vehicles, Detroit's Big Three grabbed 47 percent of sales last year — up from 45.1 percent in 2010 and 44 percent in 2009. Our friend Micki Maynard of Changing Gears, though, reports that the Detroit companies' comeback — in terms of market share — may be over. In a piece for Forbes (she's also done a companion post on Changing Gears), Micki writes that "in the first three months of the year, the three Detroit companies collectively gave up all the share they gained in 2011, and then some. ... Through March, Detroit's three car companies held 44.3 percent of the American market, essentially where they were in 2009, according to Autodata." The companies' sales have been up, but so have sales for their competitors. "2) Toyota got stronger. ... Its market share is climbing back, thanks to new members of the Prius family, and the newest version of the Camry. "3) Korean and European companies are gaining. ... [Germany's] Volkswagen is picking up market share, too, and it's planning to build more cars at its new plant in Tennessee."